Evernote app is now available for BlackBerry PlayBook tablet. If you're not familiar with the app, from notes to ideas to snapshots to recordings, you can put it all into Evernote and watch as everything instantly synchronizes from your BlackBerry phone or tablet and to your Mac or PC. 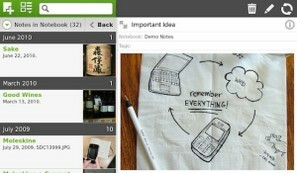 Evernote for the BlackBerry PlayBook is available for download FREE on the App World. 0 comments on "Evernote app for BlackBerry PlayBook released"